ST. GEORGE —The Grand Canyon-Parashant National Monument was heralded on March 21 by the International Dark Sky Association, or IDA, for the unspoiled quality of its pristine and breathtaking night skies. The Monument received the official IDA designation as “Parashant International Night Sky Province,” joining other international Night Sky Places. “We celebrate this prestigious designation which recognizes what visitors to the Monument have known and treasured since its inception – that the Parashant’s flawless night skies represent another portion of the impeccable, cherished, cultural and natural resources tied directly to the management of these public lands,” Grand Canyon-Parashant National Monument Manager Pam McAlpin said of IDA’s announcement Friday. The Grand Canyon-Parashant National Monument’s “Parashant International Night Sky Province” designation means the Monument now joins an impressive group of Night Sky Places that span the United States and the globe. From Big Bend National Park and Death Valley’s International Dark Sky Parks designations in Texas and California, and The Headlands in Michigan to International Night Sky Places in Ireland, Scotland, France, Hungary, Germany and Africa, Night Sky Places are sought out by the scientific community, eco-tourists, and astronomy enthusiasts worldwide. Twenty-two organizations throughout the southwestern United States supported the Grand Canyon-Parashant National Monument’s nomination for IDA’s “Dark Sky Park” status, including the scientific community which highly values the Monument’s pristine “Gold Tier” night sky viewing, which creates prime research and discovery opportunities. Grand Canyon-Parashant National Monument is jointly managed by the Bureau of Land Management and the National Park Service under the Service First Authority. While the designation is not new to public lands management units administered by the National Park Service, this is the first Dark Sky designation for the BLM. BLM Principal Deputy Director Neil Kornze expressed enthusiasm at the announcement of the designation which aligns with the mission of BLM’s National Conservation Lands to conserve, protect, and restore nationally significant landscapes. National Conservation Lands are also recognized for their outstanding cultural, ecological and scientific values. For Kornze, the designation enhances and emphasizes one of the Grand Canyon-Parashant National Monument’s best resources, he said. 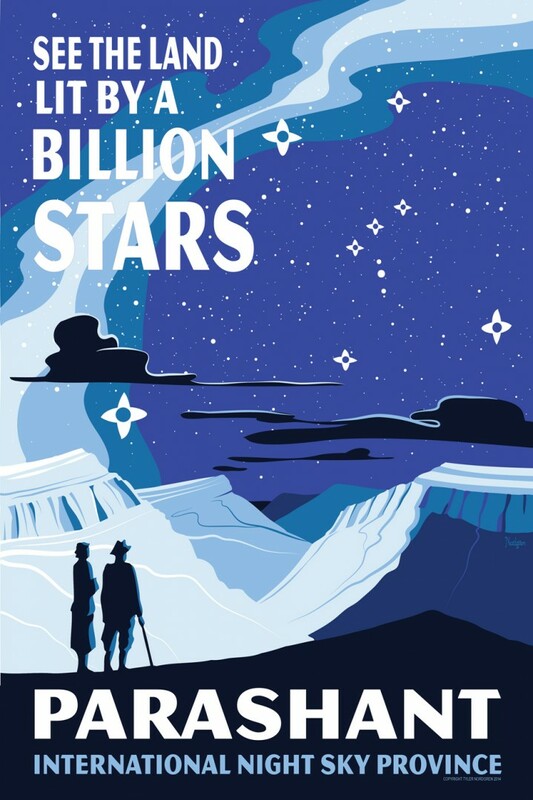 The Monument’s new “International Night Sky Province” status could also prove to be a boost to local economies which rely heavily on tourism dollars by attracting a more diverse group of low-impact visitors to the remote Monument, including the scientific community, eco-tourists, and astronomy enthusiasts. Support of the Monument’s new status will be entirely voluntary as well and will not impact residential, business or community lighting or events. 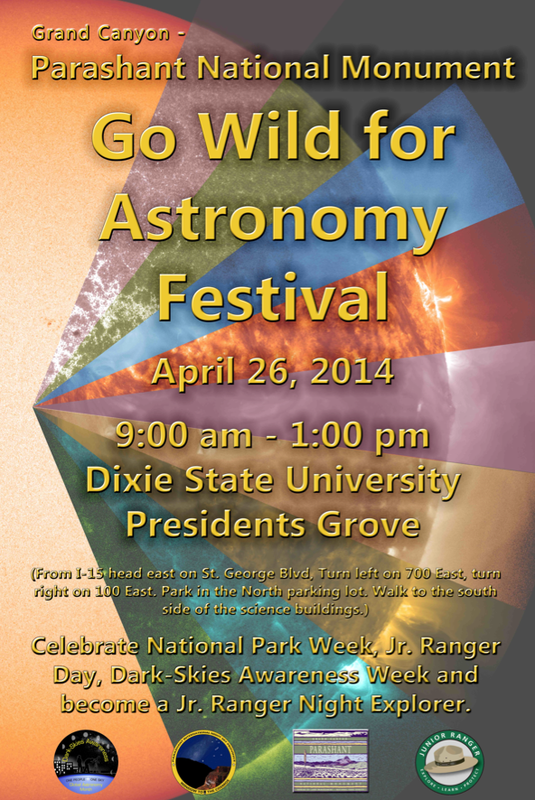 On April 26, a public event and Daytime Astronomy Festival is scheduled in St. George on April 26 at Dixie State University to officially recognize the “Parashant International Night Sky Province” designation and celebrate National Park Week, International Dark Sky Awareness Week, and Junior Ranger Day. A full line up of activities is being planned, including a reading and signing of a Southern Paiute Sky Story “Why the Moon Paints Her Face Black” by Eleanor Tom and Chloe Valentine Brent and the unveiling of a specially designed art poster created by Dr. Tyler Nordgren. A variety of information booths, along with astronomy related educational programs for children and a chance to earn a Junior Ranger Night Explorer badge will also be part of the festival. For more information please call 435-688-3377. When: April 26, 9 a.m. to 1 p.m. Thank you to Eathan McIntyre for all the hard work you put into this project to make this designation possible. Thanks for your comment Rhonda. He will appreciate it! I am so proud of Eathan for the dedication and motivation with which he works. He definitely deserves acknowledgement for this, and we hope many people get to reap the benefits of his hard work for many years to come!